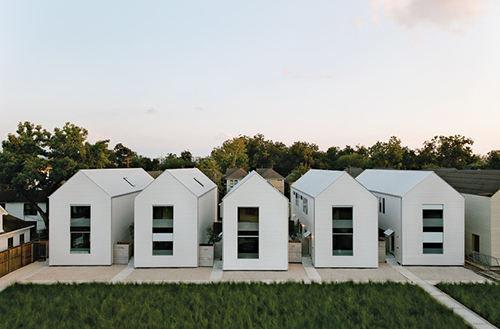 Called the Row on 25th, these energy efficient mod homes were made possible by Atlanta based developer, Holden Shannon and the design/build team of Matthew and Tina Ford of Shade House Development. Their intention was to integrate design, development and construction, to control costs and at the same time push both design and quality. Each home is an impressive 1900 square feet with the build out costs kept to $170 a square foot. Holden lives in this unit (which he also lived in during the build to tweak design elements as needed). Outfitted by Barbara Hill, the interior design includes the Nook bed from Blue Dot, an Elva Stewart painting and polished brass table lights from Tom Dixon. Building nine homes at once helped keep costs down so they were able to spend a bit more on the flooring- available in ash or my personal favorite, reclaimed longleaf pine flooring. These salvaged floors from the 1880's are incredible, bringing so much value and character to the homes. 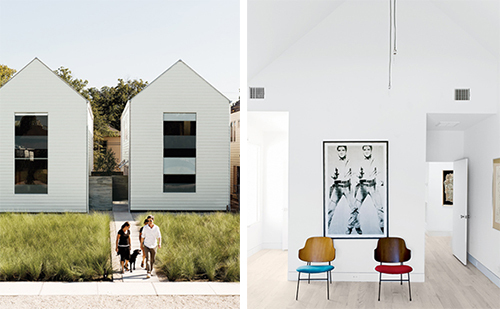 The homes are meant to feel light and spacious, with ample room for entertaining. The kitchen cabinetry was designed by the Fords and handcrafted locally. This savings left a bigger budget for top notch applicances, including an energy efficient Asko dishwasher, a Sub-Zero fridge and Bertazzoni gas range.